Gavin Brown’s current work recalls the sights, flavours and moods of his recent explorations of Asia. 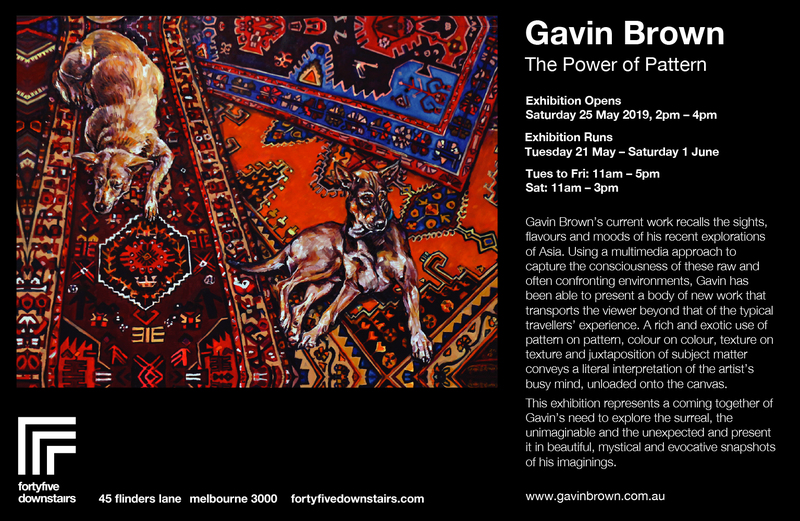 Using a multimedia approach to capture the consciousness of these raw and often confronting environments, Gavin has been able to present a body of new work that transports the viewer beyond that of the typical travellers’ experience. A rich and exotic use of pattern on pattern, colour on colour, texture on texture and juxtaposition of subject matter conveys a literal interpretation of the artist’s busy mind, unloaded onto the canvas. This exhibition represents a coming together of Gavin’s need to explore the surreal, the unimaginable and the unexpected and present it in beautiful, mystical and evocative snapshots of his imaginings.